Everybody who has seen THE DEAD DAISIES live will agree that the Australian/American five-piece fronted by former MOTLEY CRUE and THE SCREAM vocalist John Corabi are not only a band composed of exceptional musicians but great fun on stage. After three studio albums and several metamorphoses line-up-wise, the DAISIES have established themselves as a bona fide all-star band with Doug Aldrich and David Lowy on guitars, Marco Mendoza on bass and Brian Tichy on drums. Several shows from the band's 2016 UK and European Tour promoting their last studio album Make Some Noise were recorded and the result is their first and much-anticipated live album Live & Louder. The present digipack includes the album itself and a DVD with a total playing time of 85 minutes featuring the documentary “Live & Louder”, tour recaps that will take you literally around the world with the DAISIES as well as a slideshow and four video clips. The live album contains sixteen tracks recorded at various shows during the band's UK and Europe tour in autumn and winter last year. The opener “Long Way To Go” sets the tone of the album: this is rock 'n' roll the way it should be – live, loud and relentlessly energetic. And so it continues. The focus is certainly on the material from the DAISIES' last studio album, Make Some Noise, and this is exactly what both the band and their various British and European crowds are up to and which is suitably documented by the roof-raising live version of the title track, to name but one. The catchy mid-tempo number “We All Fall Down” features a stunning guitar solo by Doug Aldrich, whose guitar work does not only fit perfectly in the DAISIES' music but takes the band to another level. One of the sonic highlights of the album – and it is difficult to single one out – is “Mainline”, aptly introduced by John Corabi as “the ballad from the record”. The DAISIES' live album is not just packed with sweat-inducing rock 'n' roll posing a serious threat to your speakers, but also with great fun moments such as the introduction of the band, which is over five minutes long. I won't spoil it by telling you the details, so go and buy the recording. 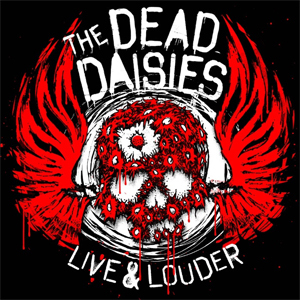 The DAISIES' first album is represented best by the “oldie but goodie” (John Corabi) “Lock 'N' Load” and their second studio effort Revolución by “Mexico”, “Something I Said” and my favourite, “Midnight Moses”. Live & Louder is one of the best live albums I have heard in quite a while: the band's stellar playing is extremely tight, singer John Corabi is in great shape and the boiling hot atmosphere of the DAISIES' shows is brilliantly captured. Thanks to the mix by Anthony Focx, who has worked with AEROSMITH, BAD COMPANY, METALLICA and SANTANA, and the mastering, which was in the most capable hands of Howie Weinberg, the sound is both enormously powerful and crystal clear – you can follow every instrument with ease. Live & Louder leaves no doubt that rock 'n' roll is still alive and blasting. It's difficult to find anything that does not justify five out of five. Grab a copy of Live & Louder in the KNAC.COM More Store right HERE.